Point to Tools and click Attendance Barcode Reader. Each time the scanner is launched you must set Attendance Barcode options. 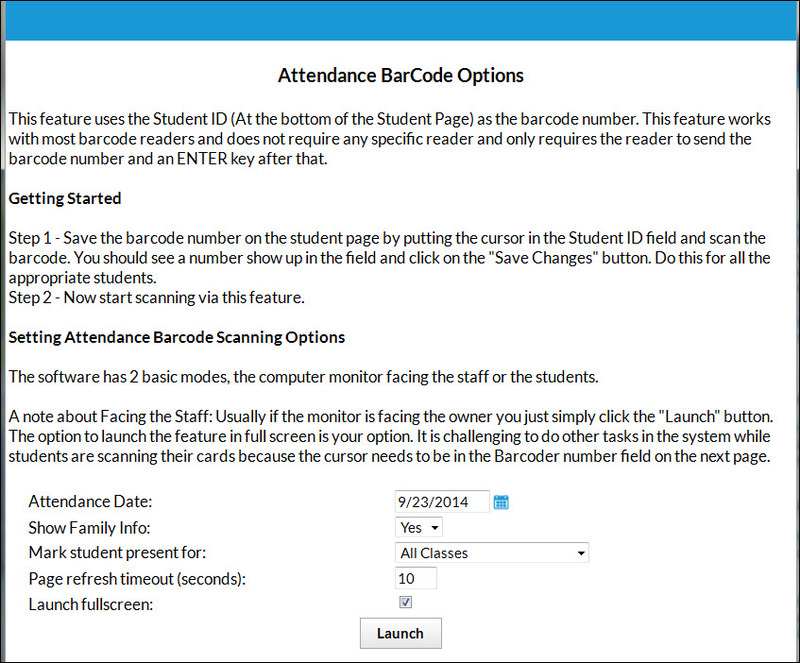 In the Attendance Barcode Options pop-up box, make choices as applicable. Attendance Date - Defaulted to current date. Use calendar icon to change. Show Family Info - Set to Yes if the computer monitor faces the owner/staff. If set to Yes, student picture (if uploaded), name, age, class, family address, phone, balance, problem account status displays on screen. Set to No if the computer monitor faces the student. If set to No, the student picture, name, age, and class displays. Set to All Classes to mark student present for all enrolled classes that day. Set to Single Class to mark a student present for a single class. Page refresh timeout (seconds) - Set the number of seconds the student info is displayed before resetting for the next student. Launch fullscreen - Defaulted to checked (yes). Uncheck to remain in pop-up window.